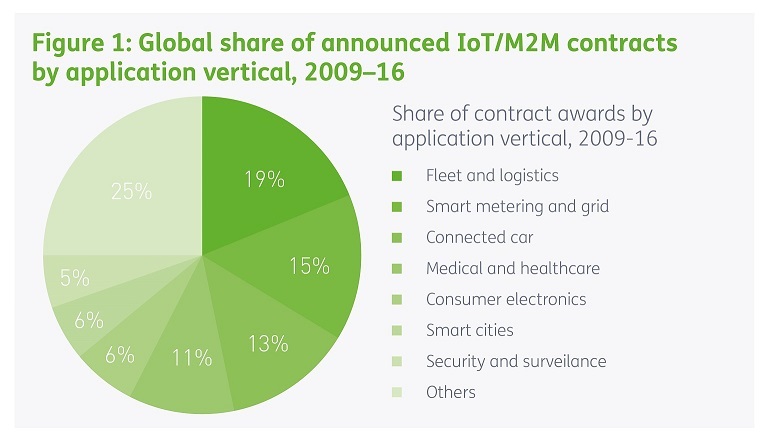 This year will bring important IoT advancements in a number of industry vertical markets, including some that up until now have been more in the “IoT development” phase. While organizations within early-adopter industries (for instance, manufacturing and logistics, fleet management, and utilities) have already started to realize significant cost savings and efficiency impact from machine-to-machine (M2M) deployment, IoT initiatives and impact are now gaining momentum in a number of other verticals. Below we examine upcoming trends, and opportunities, for four of these IoT vertical markets: connected and autonomous cars, the smart home, smart cities, and insurance services. As IoT technologies and applications continue to develop, enterprises and public sector organizations are increasingly becoming aware of the potential benefits of the IoT and are starting to think about how IoT-enabled services fit in with existing business processes and new business models. In many cases, however, there is more “supplier push” than “demand pull” as the market is still in the early stages. We are seeing significant progress in business-to-business-to-consumer IoT propositions, ranging from smart home to smart cities (both for citizen-facing propositions and city management in areas like public safety and environment), and encompassing connected cars and related telematics-based insurance propositions. As licensed spectrum low-power wireless access (LPWA) technologies are commercialized, IoT opportunities will extend to more verticals and more new applications. We will see a clearer mapping of which technologies are best suited for specific use cases emerging this year, as well as increased focus on providing enterprise customers with truly end-to-end IoT solutions. This will drive development and take-up of IoT solutions in different verticals. There has been much talk of communications service providers (CSPs) evolving into platform companies, and many now have multiple customers for their IoT platform offerings. But those service providers achieving the greatest IoT success thus far have focused on co-creating IoT solutions for specific enterprise use cases, in specific verticals. Leading CSPs are now really starting to see the positive results emerging from IoT partnering and co-creation efforts that began two or, in some cases, even three years ago. Many have focused on a few specific verticals, as illustrated in Figure 1. Transferring applications and experience from one vertical to another will be a goal for all major market players this year and beyond. Look for an ongoing shift away from providing core car connectivity via tethered smartphones or user-installed broadband devices, to delivering built-in connectivity in new cars; but smartphones will still be an important remote control and authentication interface (and a highly vulnerable one). The idea of car and home integration is growing, as is that of seamless interoperability between the two environments, and personalization in the car. In autonomous driving development, the vision is shifting from 100% autonomous driving as a near-to-medium-term goal in itself, to a greater focus on a “zero-accident” world.